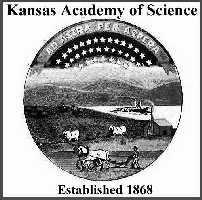 Abstracts were published in: Transactions of the Kansas Academy of Science Abstracts, Volume 22, 2003. A JUVENILE MOSASAUR FROM THE SHARON SPRINGS (LOWER) MEMBER OF THE PIERRE SHALE, NIOBRARA COUNTY, WYOMING. Kenneth S. Bader (1). Natural History Museum and Biodiversity Research Center, University of Kansas, Lawrence, Kansas. In the late 1970s two mosasaurs and a short-necked plesiosaur were collected approximately four meters below the Ardmore Bentonite in the Sharon Springs (Lower) Member of the Pierre Shale Formation outside of Redbird, Wyoming. Upon preparation in the fall of 2002, skeletal elements of a juvenile mosasaur were discovered alongside an adult Plioplatecarpus (KUVP 69465). The juvenile skeleton consists of a complete left humerus and left pectoral girdle. As mosasaurs grow, an interdigitating suture develops between the scapula and coracoid. This feature is not present in the specimen suggesting that it is either a neonate or an early juvenile. Poorly developed muscle scars on the humerus support this hypothesis. Although incomplete, the coracoid is much larger than the scapula and the surface of the glenoid fossa is smoothly concave. Both characteristics identify the specimen as Clidastes, comparatively rare in the Pierre Shale in comparison to other mosasaurs. Juvenile Plioplatecarpus and Mosasaurus are commonly found in the Big Bend area of central South Dakota while they are rare in Western South Dakota and Eastern Wyoming. 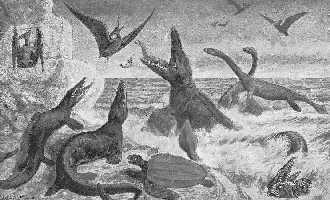 The presence of a juvenile Clidastes in Eastern Wyoming during the deposition of the Sharon Springs Member indicates that young mosasaurs lived where water depths may have reached 100 meters in anoxic conditions. THREE-DIMENSIONAL GEOMETRY OF THE WING OF A LARGE PERMIAN DRAGONFLY FROM ELMO, KANSAS (INSECTA: MEGANISOPTERA: MEGANEURIDAE: MEGATYPUS SCHUCHERTI TILLYARD). Roy J. Beckemeyer, Research Associate, Johnston Geology Museum, Emporia State University, Emporia, Kansas. Both extant dragonflies (Odonata) and extinct dragonfly-like insects (Meganisoptera) are characterized by the presence of alternating concave and convex longitudinal wing veins that provide corrugation-like stiffening to the anterior wing. This is a character that has been present since the Carboniferous. The arrangement and three-dimensional structure of these veins and the cross veins that connect them provide the wings of current Odonata with "tailored" aeroelastic properties that are intimately tied to flight functionality. This is also likely to be true of the meganisopterans. Measurements are being made of the three-dimensional geometry of the longitudinal veins of particularly well-preserved fossil wings. Measurement methodology is reviewed, and preliminary results of measurements of the wings of specimens (from Kansas State University and the Yale Peabody Museum) of the Elmo, Kansas, taxon, Megatypus schucherti are presented and discussed. DIGITAL PREPARATION OF AN EMYDID TURTLE FROM THE MIOCENE (CLARENDONIAN) OF NEBRASKA WITH A REVIEW OF THE FOSSIL HINGED EMYDIDS OF KANSAS AND NEBRASKA. Gabe S. Bever (3) and Amy M. Balanoff. Dept. of Geological Sciences and Vertebrate Paleontology Laboratory, The University of Texas at Austin, Austin, TX. High-resolution x-ray computed tomography (CT) rapidly is becoming an invaluable tool in the study of fossil vertebrates. Digital preparation provides a non-destructive method of examining internal structures not readily accessible with traditional preparation techniques. A fossil turtle collected from Clarendonian-aged sediments of the Valentine Formation (Brown County, Nebraska) provides a clear example of the advantages of this technology. The specimen includes approximately the anterior one-half of an articulated carapace and hinged plastron. Within the shell lies a partially articulated skull that is visible only in anterior and to a lesser degree in posterior views. Digital removal of the shell reveals that most of the cranial elements are present, as well as the rarely recovered hyoid apparatus and portions of the pectoral girdle and forelimb. The importance of our ability to access the skull of this turtle is significant considering that cranial elements of hinged emydids are extremely rare in the Tertiary fossil record of North America. The systematic and taxonomic positions of this specimen are problematic and emphasize the need for a reappraisal of emydid morphological characters in light of competing phylogenetic hypotheses. A NEW MOSASAUR FROM THE SOUTHERN INTERIOR SEAWAY. David A. Burnham (3). University of Kansas Natural History Museum, Lawrence, Kansas. Although mosasaurs are well represented in the Cretaceous western epicontinental seaway, the Mississippi Embayment to the south has yielded few complete specimens. A fossil skeleton collected from the Demopolis Formation (Campanian) in Lee County, Mississippi provides new information from this area. Preliminary analysis indicates it may be a new species, but is congeneric with Plioplatecarpus reported from Alabama. The new mosasaur is well preserved and fairly complete consisting of most of the axial skeleton. This includes the skull elements premaxillae, maxillae, frontals, parietals, quadrates, squamosals, left prefrontal and pterygoids. The rest of the cranial elements and the braincase are missing. The dentaries and posterior mandibular bones were also collected. The vertebral column is represented by four cervicals, 17 dorsals, (two of which are pathologically fused), 7 ribs plus many fragments of others and 3 pygal vertebrae. The missing portions include the rest of the tail, girdles and flippers. Certain morphological characters are consistent with those described for Plioplatecarpus. Such as the enlarged pineal foramen, swelling on infrastapedial process of the quadrate, and ribs with rounded cross sections. A BIOMECHANICAL ANALYSIS OF SAUROPOD NECK MORPHOLOGY. Matthew T. Christopher (2), Natural History Museum and Biodiversity Research Center, University of Kansas, Lawrence, Kansas. Sauropod dinosaurs were the largest animals to ever live on land. This group of giants seems to have pushed the large size limits of vertebrate adaptability in terrestrial environments farther than any other group. I recently prepared many articulated sauropod neck bones and observed traits for strengthening and lightening the skeleton, and for supporting soft tissue. I address these evolutionary features that helped fight the effects of gravity on the sauropod body and mechanical properties of biomaterials that build the skeleton and tendons. Inferences about sauropod biology are made regarding feeding. Brachiosaurid dinosaur neck mobility is limited from the third cervical vertebra caudally to the second or third cervical before the dorsal transition. Long cervical ribs functioned to support the girth of stout necks and helped Brachiosaurids browse at higher trophic levels. In Diplodocids, nuchal ligaments grew to a girth that supported drastically more gracile necks. Also, the zygapophysies of Diplodocids have more vertically mounted, higher-area articular faces allowing a wider range of motion horizontally. The zygophophysial arrangement in concert with the nuchal ligaments supported the neck, but prevented this group from elevating the neck high enough to be effective browsers. Comparing dental arrangements in Brachiosaurids and Diplodocids confirms their respective roles as browsers and grazers. EQUIDAE (MAMMALIA: PERISSODACTYLA) FROM THE MIOCENE MINIUM QUARRY, GRAHAM COUNTY, KANSAS. Michelle K. Darnell, Sternberg Memorial Museum, Hays, Kansas. Fossilized unassociated teeth and post-cranials of three tridactyl, grazing equids, Calippus sp., Protohippus gidleyi, and Neohipparion eurystyle, were recovered from the Minium Quarry local biota in Graham County, Kansas. The quarry was located in sheet flood sediments of the late Miocene Ash Hollow Formation and contained a diverse Early Hemphillian biota indicative of a savanna. Teeth of Calippus and P. gidleyi were distinguished from those of N. eurystyle by connected protocones. Teeth of Calippus were divided from P. gidleyi by smaller size and absence of the pli caballin. Teeth of N. eurystyle were identified by the isolated protocone, expanded and constricted styles, hypoconal groove extending completely down the crown, more complex plications, and large, elongated metaconids and metastylids. Metapodials and tibiae were diagnostic. Those of Calippus were assigned by small adult size. Protohippus metapodials exhibited shorter, incomplete scars for the interosseous metapodial ligaments and a shallow posterior gully, whereas Neohipparion metapodials had complete scars and a deeper posterior gully. Protohippus tibiae had a deep, well-developed, distinctly bounded groove for the flexor digitalis longus tendon that extended one-quarter up the shaft. Conversely, Neohipparion tibiae had a shallow, short groove with indistinguishable borders. BUFFALO LAND (1872) WILLIAM WEBB AND EDWARD DRINKER COPE CO-AUTHORS? Jane P. Davidson, Department of Art, University of Nevada, Reno, Nevada. In 1872 William E. Webb, the Kansas Pacific Railroads land agent, published Buffalo Land. It was typical of land promotional books offered by railroad, but it was also atypical since it contained an entire scientific paper by Edward Drinker Cope, and a fictional character based on Cope. Buffalo Land tells the adventures of a "scientific and sporting party" exploring the terminus of the Kansas Pacific around Fort Wallace. Its illustrator was a Native American, Henry Worrall. Webbs party was led by a wonderful character, "Professor Paleozoic." 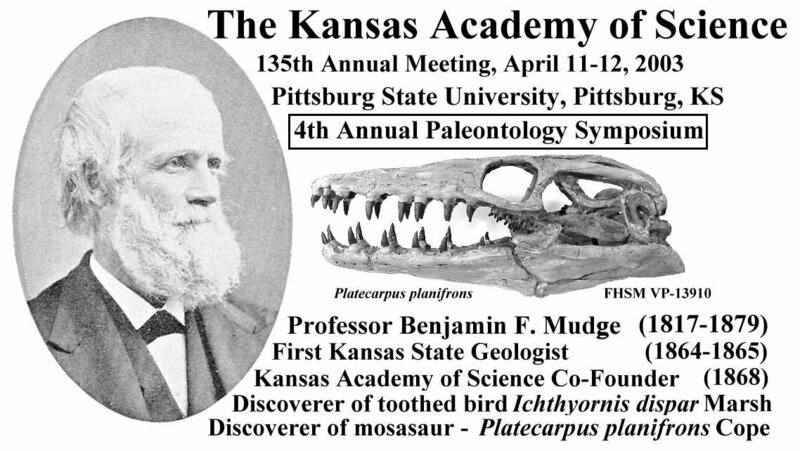 I suggest that Cope was probably the model for Paleozoic though the illustrations of the "Professor" look like a youthful Louis Agassiz. The paper discusses connections between Webb and Cope, and Webb as a collector who provided fossils for Cope and other paleontologists. Cope even named a fossil for Webb. Did Cope and Webb work together in the field? In one chapter of Buffalo Land, Webb used Copes "On the Geology and Paleontology of the Cretaceous Strata of Kansas," first published in the 1872, Preliminary Report of the United States Geological Survey of Montana and Portions of Adjacent Territories, (Hayden Survey). Textual changes in Copes 1872 publication indicate that Webb used an earlier draft given him by Cope. FIRST REPORT OF THE PALEOZOIC SHARK, CTENACANTHUS AMBLYXIPHIAS COPE 1891 FROM THE LOWER PERMIAN OF MORRIS COUNTY, KANSAS. Michael J. Everhart, Sternberg Museum of Natural History, Fort Hays State University, Hays, Kansas, and Pamela A. Everhart, Derby, Kansas. A NEW CLASS OF DAIMONELIX BURROWS FROM THE EARLY MIOCENE OF NEBRASKA. Gobetz, K. E. and L. D. Martin, Museum of Natural History and Department of Ecology and Evolutionary Biology, University of Kansas, Lawrence, Kansas. Martin and Bennett have described the construction and distribution of Palaeocastor fossor burrows (Daimonelix) in the Early Miocene Harrison Formation of northwestern Nebraska. P. fossor is a flat-incisored, short-tailed beaver about the size of a woodchuck, Marmota, that lived in Prairie Dog-like colonies in dry uplands. It dug a spiral burrow through a combination of incisor and foot activities. Smaller groupings of smaller spiral burrows occur separately from the P. fossor burrows. These contain skeletons of another fossorial beaver, Pseudopalaeocastor barbouri, that is about the size of the modern Prairie Dog, Cynomys. These burrows may be included in the form taxon for spiral burrows (Daimonelix) but should be treated as a different species of ichnofossil. Pseudopalaeocastor burrows are shorter than those of Palaeocastor and lie entirely within the root zones of fossil soils. Like those of Palaeocastor they were excavated with the help of the incisors. A JUVENILE RUDISTID FROM THE CRETACEOUS OF KANSAS: EVIDENCE FOR EVOLUTIONARY OR ENVIRONMENTAL DEVELOPMENT? Shawn Hamm (1), C. D. Burke, Dept. of Geology, Wichita State University, Wichita, Kansas and Mike Everhart, Sternberg Museum, Fort Hays State University, Hays, Kansas. THE PERSISTENCE OF TROPICAL HONEYBEES THROUGH THE CRETACEOUS-TERTIARY BOUNDARY AND ITS IMPLICATIONS ON THE ASTEROID THEORY. Jacqueline Kozisek (1), The University of Kansas Natural History Museum and Biodiversity Research Center, Lawrence, Kansas. Bee fossils are widely distributed in the Late Cretaceous, including the Latest Cretaceous (Maastrichtian) amber fossil of the tropical honeybee Trigona prisca (Hymenoptera: Apidae) in New Jersey. During the Late Cretaceous, the tropics extended from Arizona to New Jersey. Alvarez initially proposed that an asteroid impact would throw the earth into something analogous to a nuclear winter for several years (Alvarez, et al.. 1980), this interval has been currently reduced to several months. It was proposed that during the K-T boundary event, temperatures decreased 7-12C, reducing the tropics to a temperate climate. It has also been shown that tropical honeybees have an optimal temperature range of 26-36C, but freeze at 0C, become immobilized at 11C, and the brood dies below 28C. Tropical bees require a year round supply of flowers, thus tropical conditions must have persisted through out the period influenced by the impact. This persistence of the tropics places limitations on the maximal effect of the impact. ZOOARCHAEOLOGY AS A KEY TO CLIMATIC HISTORY. Martin, L.D. and J. Bright-Martin; Museum of Natural History and Department of Ecology and Evolutionary Biology, 1345 Jayhawk Blvd., University of Kansas, Lawrence, Kansas. Biogeographic maps are the primary tools for the study of the relationship of biology to regional climate and topographic variability. While topography has remained fairly constant during the last ten thousand years, climate has not. The Central Great Plains has been significantly colder during this time interval and it is possible that it has been at least as hot. Rainfall has fluctuated in concert with these changes resulting in fluctuation of the margins of major biomes. This climatic variability is especially evident in Kansas where there is close proximity of several major vegetation types. The modern northern expansion of mammalian warm climate indicators is not without precedence. Armadillos, cotton rats and rice rats have all been temporary visitors to Kansas during previous periods of increased temperatures. Our present temperature high follows a period of extreme low temperature, the Little Ice Age. It is not clear that the present high temperature period really exceeds conditions that preceded the Little Ice Age. Before we can fully understand past biotic changes, we must construct biogeographic maps based on archaeological records that predate the effects of European Agriculture on our native biota and assess the impact of past temperature fluctuations. MOSASAUR GROWTH RATES, LONGEVITY AND AGE OF ATTAINMENT OF SEXUAL MATURITY DERIVED FROM LIMB BONE SKELETOCHRONOLOGY. Rodrigo Pellegrini (2). Dept. of Geology, University of Kansas, Lawrence, Kansas. Skeletochronology has proven a useful and reliable method for biological studies of modern monitor lizards. For the first time, the paleohistology of the limb bones of their extinct relatives, the mosasaurs Tylosaurus, Clidastes, and Platecarpus, is analyzed. The objective is to obtain paleobiological data such as growth rate, longevity, age at sexual maturity and thermoregulatory indications for each taxon. In addition to lines of arrested growth (LAGs), a poorly understood type of growth line (the supernumerary LAG) is investigated and its possible significance proposed. Although the osteo-histologies of mosasaurs and modern monitors are distinct, the data obtained suggests Tylosaurus, Clidastes, and Platecarpus grew and lived as modern reptiles do. The differences in the bone microstructure of modern monitors and mosasaurs are a result of the distinct adaptive zone that the latter occupied as large, fully marine animals. THE UNIVERSITY OF KANSAS FOSSIL COLLECTING EXPEDITION OF 1895. Craig Sundell (2). Dept. of Ecology and Evolutionary Biology, Univ. of Kansas, Lawrence, Kansas. On June 13, 1895, a group of scientists and students, led by Samuel Williston, left Lawrence, KS by train. They traveled west and north until they reached the small town of Badger in the SE part of Wyoming. Among the group were the future paleontologists Elmer Riggs and Barnum Brown (Willistons students), Will Snow, entomologist and son of KUs chancellor, Francis Snow, and J. P. Sams, who kept an important diary of the expedition. They were joined on June 25th by Dr. Wilber Knight of the University of Wyoming and his guide William Reed. Reed is best known for his discovery and work on Jurassic dinosaur and mammal fossils from 1877 on in the Morrison Fm. at Como Bluff Wyoming. During a six week period this group collected significant vertebrate fossils from Tertiary, Cretaceous and Jurassic deposits from southeast to east central Wyoming. Their collections include Browns first dinosaur (a Triceratops skull from the upper Cretaceous Lance Fm. ), which became the first publically displayed Triceratops. Other significant dinosaur finds include bones from Camarasaurus, Apatosaurus, Diplodocus and Allosaurus from un-revisited Jurassic Morrison Fm. outcrops east of Laramie Peak. A metatarsal bone, if from the Lance Fm., may well be one of the earliest bones recovered from T. rex. A RARE OCCURRENCE OF THE LATE CRETACEOUS PTYCHODONTID SHARK, PTYCHODUS POLYGYRUS AGASSIZ 1839, IN THE SMOKY HILL CHALK MEMBER (NIOBRARA FORMATION) OF WESTERN KANSAS. Tom Caggiano, 145 Hayrick Lane, Commack, New York, and Michael J. Everhart, Sternberg Museum of Natural History, Hays, Kansas. NOTE ON THE OCCURRENCE OF FIVE SPECIES OF PTYCHODONTID SHARKS FROM A SINGLE LOCALITY IN THE SMOKY HILL CHALK (LATE CRETACEOUS) OF WESTERN KANSAS. Michael J. Everhart, Sternberg Museum of Natural History, Fort Hays State University, Hays, Kansas, Tom Caggiano, 145 Hayrick Lane, Commack, New York, and Kenshu Shimada, Environmental Science Program and Department of Biological Sciences, DePaul University, Chicago, Illinois. THREE UNCOMMON LAMNIFORM SHARKS FROM THE SMOKY HILL CHALK (UPPER CRETACEOUS) OF WESTERN KANSAS. Shawn A. Hamm (1), Department of Geology, Wichita State University, Wichita, Kansas; Kenshu Shimada, Environmental Science Program and Department of Biological Sciences, DePaul University, Chicago, Illinois; Michael J. Everhart, Sternberg Museum of Natural History, Fort Hays State University, Hays, Kansas.